Do you ever find yourself searching for the perfect basic pattern? I do. A lot. I sometimes get an image or idea in my head and just /need/ to find the perfect pattern to bring that dream to fruition. I’m a fan of woven tees: Simple shape, but just ever so elevated from a knit tee to make me feel a bit more put together. Great for spring and summer and fall. But I think this particular obsession with finding the ‘perfect’ woven tee pattern all started with some fabric. Ahhh…beautiful fabric. The kind of thing you run across when you’re not looking to buy anything like it, but it’s just so pretty that you can’t leave the store without it. (C’mon, you KNOW what I’m talking about, right?). So I found this fabric and thought – oooh a nice basic woven tee. My first thought was the Seamwork Akita, which I’ve made a couple times already (here and here). Then I realized that the print on this particular fabric was directional, which wouldn’t work with the Akita. So, my choices were: (1) hack the Akita to make it into 2 pattern pieces instead of one, (2) try a new pattern, or (3) hack the Akita and try a new pattern…or two…or three. Right, so I opted for (3). It’s been a while since I’ve posted something hasn’t it? 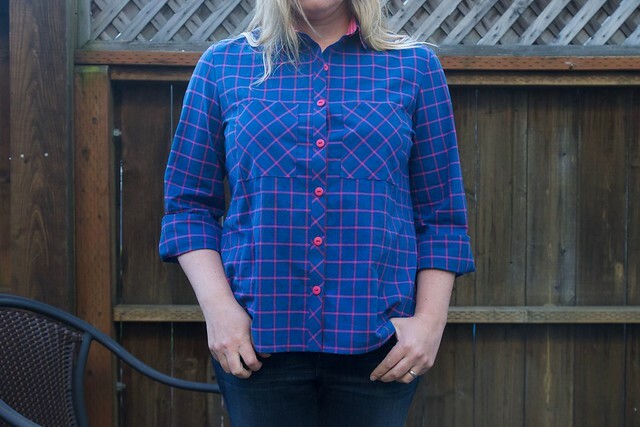 I’ve been doing plenty of sewing though and thought I would pop in with one of my recent makes…the Grainline Studio Archer button up!